POTLOC and RETAIL INSIDER joined force to evaluate the impact of the Transit Pilot on King Street West since its implementation by the city of Toronto in November 2017. Since then, King Street West is closed to through traffic between Bathurst and Jarvis, thus giving the priority to street cars riders, pedestrians and cyclists. To perform this study, POTLOC surveyed 2,062 residents of the city of Toronto. Figure out if these changes had an impact on the frequency of visits to King Street West. The central question of the study was about the primary mean of transport respondents currently use on King Street West. 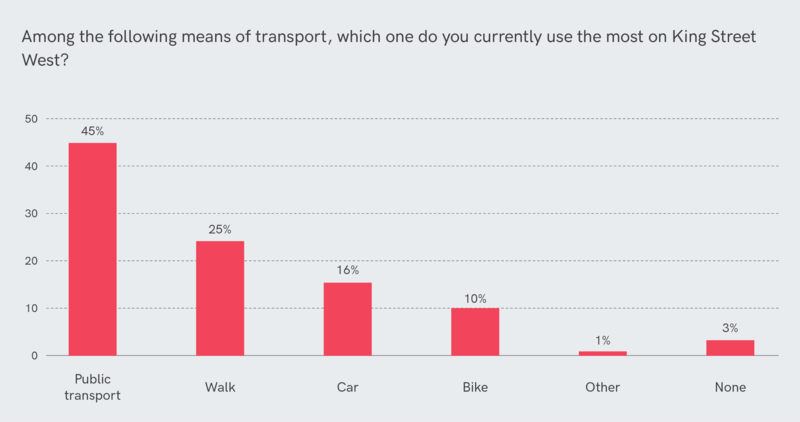 Half of respondents (45%) mainly use public transports on King Street West, a quarter (25%) mainly walk there, and the rest mainly use their car (16%) or their bike (10%). In the light of the results that will follow, this repartition most probably gives an accurate idea of the current profile of commuters on King Street West since the Transit Pilot seems to have driven car drivers away and attracted more public transport users. 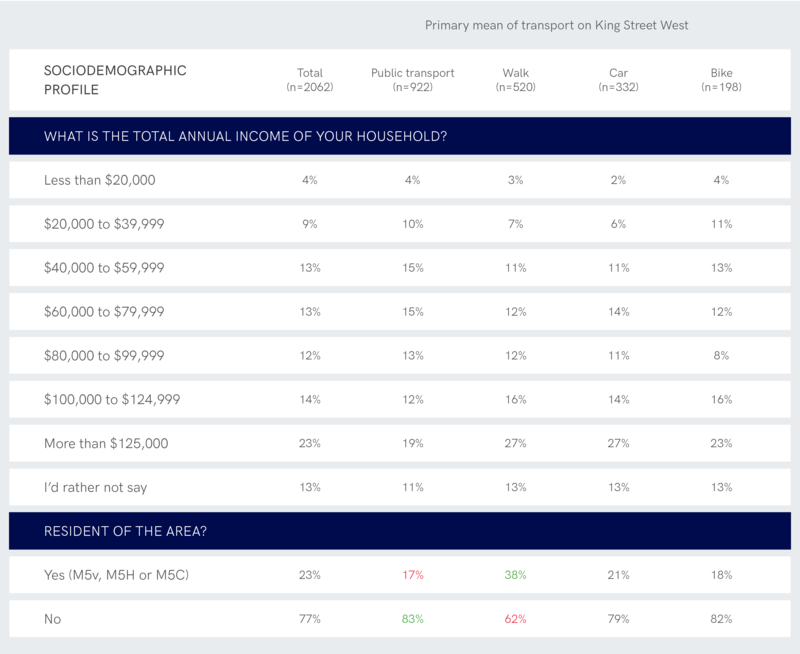 The sociodemographic profile of respondents confirms that the sample is representative of frequent commuters on King Street West. Indeed, respondents are mostly workers, hence tend to be younger (in their ‘working’ years), with higher education and revenues than what can be observed in the whole population of Toronto. Men and women are almost equally represented. Primarily public transport users: they are frequent visitors of King Street West’s shops (37% visit multiple times a week, vs. 32% overall) and are 53% to visit the shops more often since the Transit Pilot was put in place. Their motives: it is easier to get there because street cars are more reliable than before. The area is less stressful, they spend less time in commute and can take more time to shop in the area. Primarily pedestrians: they are the most frequent visitors of King Street West’s shops (41% visit multiple times a week, vs. 32% overall), but 47% declared the Pilot had no impact on their visits to King’s shops. Their motives: they were already very frequent shoppers and the Transit Pilot had no impact there. Opinion is more split: most have the same opinion as public transport users, but some believe that the street lost its vibe. Primarily car drivers: they are the least frequent visitors of King Street West’s shops (31% never visit and 25% visit less than once a month vs. 11% and 13% respectively overall). They have massively fled the street since the Transit Pilot was put in place (81% declared they visited the shops and services less often ever since). Their motives: the circulation plan is confusing, the parallel routes are jammed, it takes more time go to the area and they can’t find any parking spot on King Street anymore. Primarily bike users: their frequency of visits to King Street West’s shops is average. 47% declared they have been visiting the street more often since the beginning of the Pilot. Their main motive: they feel safer on King Street now, which contributes to them coming more often. Public transport users: a vast majority of the most frequent public transport users declared that their average time of travel on King Street has decreased and the service of street cars has gotten significantly better since the Pilot was put in place. Consequences: they are 69% to declare they have been using public transport on King Street West more often. This clearly shows the success of the Transit Pilot on the public transport side. Pedestrians: their experience has improved as well since 68% declared the Pilot made the street more pedestrian-friendly. The effort made to activate the space with public art was noticed and appreciated by 59% of pedestrians. As a result, 41% of pedestrians declared they had been walking on King more often since the Pilot was put in place. This shows the success of the Pilot in making the area more accessible for pedestrians. Drivers: the most frequent drivers on King Street believe the Transit Pilot made their commute worse for two reasons: it has increased their time spent in traffic and it has increased their overall time of travel in the area. This can be linked to the numerous detours due to the new circulation plan and the fact that parallel routes are jammed. The consequences are that half of car drivers have decreased the frequency with which they use their car on King Street West. People who have no choice but to use their car on King Street West have fled the area since the Pilot started. Bike users: they are a majority (91% for the most frequent users) to believe the Transit Pilot made King Street more bicycle-friendly. As a result, they are 57% to have declared they rode their bike there more often since the Pilot was put in place. 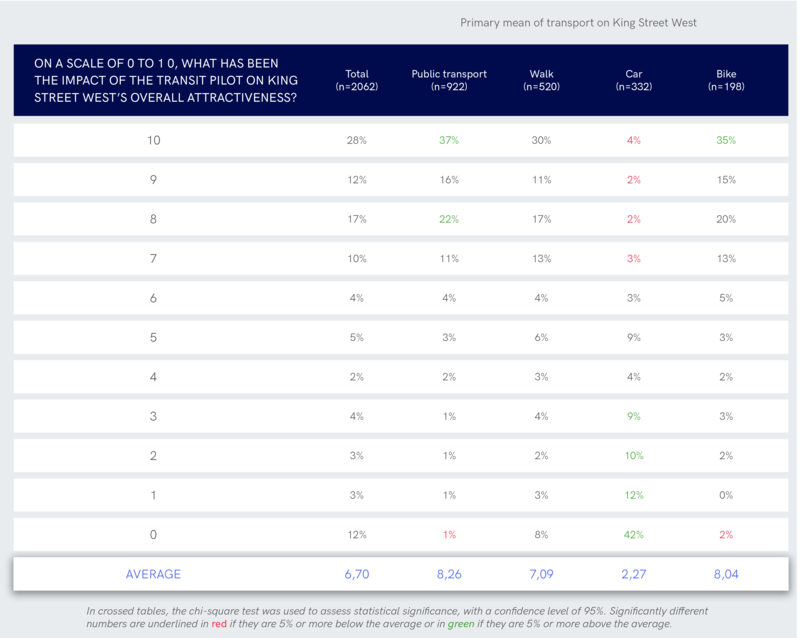 Grades given to the overall attractiveness of King Street West are yet another proof that the opinion on the Transit Pilot is split between commuters. The best grades are given by primarily public transport users (8.26/10), primarily bike users (8.04) and pedestrians (7.09) while primarily drivers gave a very poor grade (2.27). Average grade reaches 6.7/10. Results on what should be the future of the Transit Pilot tell that public transport and bike users are the ones who want it to continue or to go further the most, while car users want it to be cancelled. On average, 48% of respondents want the project to go further, 24% want it to keep going the same, and 25% want it cancelled. Finally, regarding the replication of the Transit Pilot on Queen Street, the YES wins by a slight majority (at 51%, vs. 39% of NOs and 10% of respondents undecided). The central question of the study was about the primary mean of transport respondents used on King Street West. We believed when creating the survey that this would be the main point determining whether respondents were happy or not with the whole project. This hypothesis will be verified in the following pages of this report. Every resident from the city of Toronto had an equal chance of being targeted by the survey. The people who answered it were the ones who had the most interest in the subject. This is why readers should consider that the repartition for primary means of transport is representative of the profile of frequent commuters on King Street West that were impacted in some way by the Transit Pilot. Almost half of them (45%) mainly use public transports on King Street West, a quarter mainly walk there (25%), and the rest mainly use their car (16%) or their bike (10%). It is still important to bear these results in mind while reading the rest of the report and to study average results in the light of these percentages. Among the following means of transport, which one do you currently use the most on King Street West? 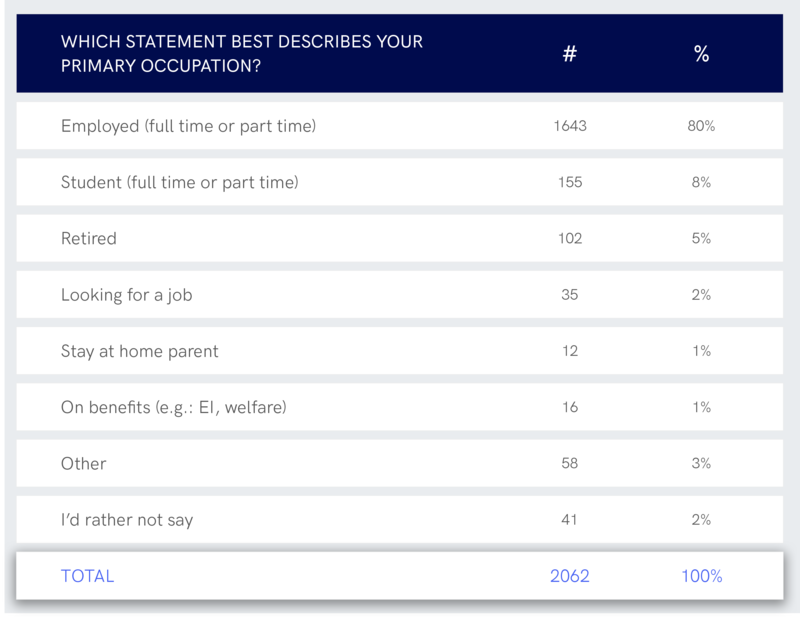 Since the sample is representative of frequent commuters in the area where the Transit Pilot was put in place, we expected the sociodemographic profile of respondents to be over-represented by workers. This can be confirmed since 80% of respondents are workers, a higher proportion that what can be observed among adult residents in the city of Toronto). 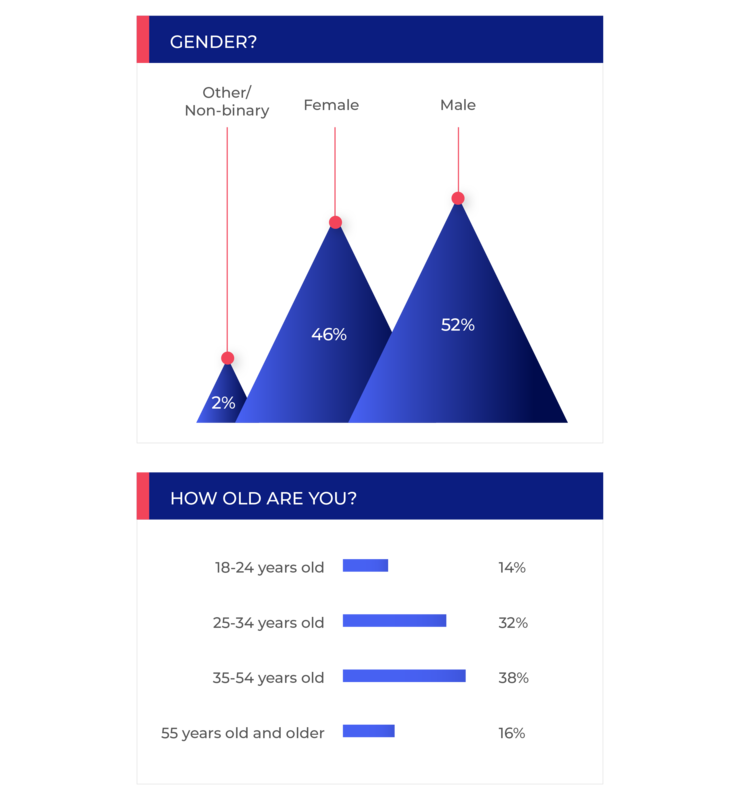 In the sample of 2 062 respondents studied, women (46%) and men (52%) are almost equally represented. Since the sample is representative of frequent commuters on King Street West, workers are logically over-represented, and so are young to middle-aged people: 70% of respondents are aged between 25 and 54 years old, compared to 52% for the whole population of Toronto. On the full table, it is interesting to notice that car users and bike users are mostly men (respectively 58% and 68% of men) while the sample of people who mainly walk on King Street is slightly more feminine than the average (52% of women). It is also interesting to note that car users are older than average (63% of car users are 35 years old and older compared to 54% overall). Bike users tend to be younger (40% of them are aged between 25 and 34 years old compared to 32% overall). 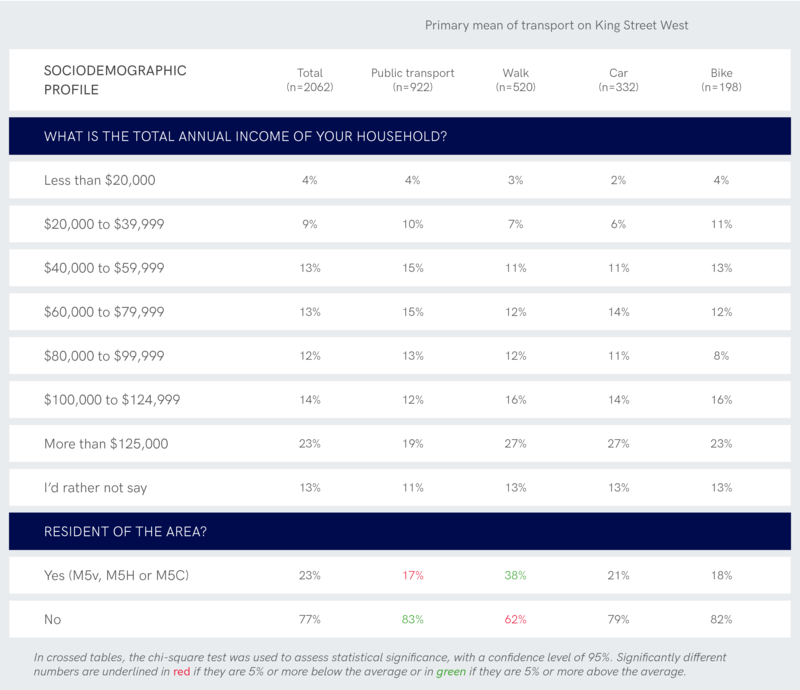 Since the sample is representative of frequent commuters on King Street West, workers are logically over-represented, and so are households earning higher revenues: 49% of respondents are part of a household whose total annual income is above $80,000, compared to 41% for the whole population of Toronto. Finally, the sample is mainly compsed of non-residents of the area around King Street West (77%), and logically, pedestrians are composed of more residents than average (38% compared to 23% overall), while the contrary applies to public transport users (only 17% of public transport users are residents of the area compared to 23% overall). The majority of respondents (80%) are employed, a key characteristics of the frequent commuters in the King Street West area where the Transit Pilot was put in place. 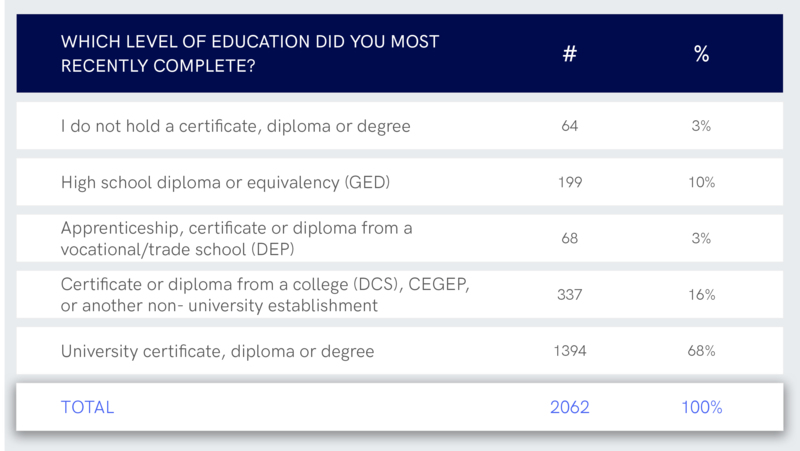 More than two-thirds of respondents (68%) hold a university degree, compared to only 36% for the whole population of Toronto, which is once again in accordance with the profile of workers in the area. The following question was asked to every respondent. It is interesting to notice that the sample of respondents is mainly composed of frequent visitors of the shops and services on King Street West, since 66% of respondents visit them at least a few times a month. SINCE THE TRANSIT PILOT WAS PUT IN PLACE IN NOVEMBER 2017, HOW OFTEN HAVE YOU VISITED THE SHOPS AND SERVICES ON KING STREET WEST? 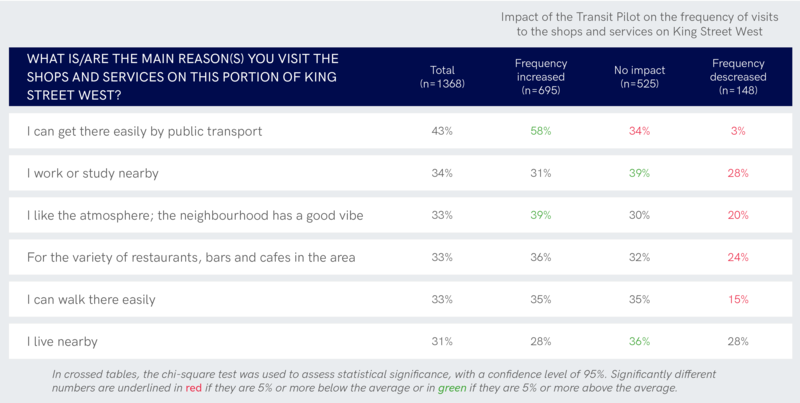 People using public transports and those who walk on King Street West are the most frequent visitors (respectively 37% of public transport users and 41% of pedestrians visit the shops multiple times a week compared to 32% of all respondents). Car users are the least frequent visitors of the shops and services since the Transit Pilot was put in place (25% visit less than once a month and 31% never visit, compared to 13% and 11% respectively overall). Residents of the area and people aged between 18 and 34 years old are more frequent visitors than average. People who are 55 years old and older are the least frequent visitors since the Transit Pilot was put in place: 20% of them never came since November 2017 (vs.11% overall). This question was asked to every respondent. On average, there are more people who said the Transit Pilot had a positive impact on their frequency of visits to the shops and services on King Street West (37%) than a negative one (24%). How has the Transit Pilot impacted your frequency of visits to the shops and services on King Street West ? People who use public transport and who bike on King Street West are more numerous to think the Transit Pilot had a positive impact on their frequency of visits (53% of public transport users and 47% of bikers compared to 37% on average). The opposite goes for car users who are 81% to say the Pilot had a negative impact on their frequency of visits, compared to 24% on average. 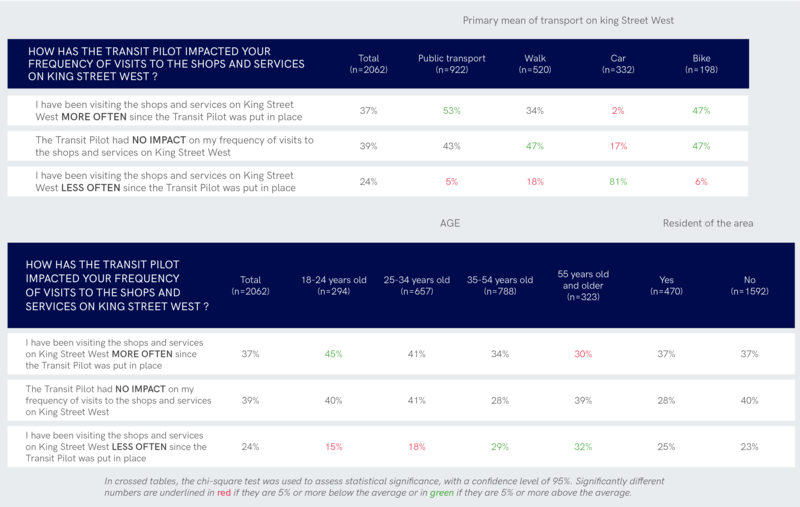 There is a clear correlation between the main mean of transport used to go to King Street West and the effect of the Pilot on the frequency of visits to the shops, but the average result still reflects the opinion of current commuters in the area. Finally, the result for pedestrians for whom the Transit Pilot mostly had no impact is to be analyzed bearing in mind they probably were already very frequent shoppers (see table 5), because they are composed of more residents of the area (see table 2). It is also interesting to see that younger people (between 18 and 24 years old) tend to come more often while older people (35 years old and older) tend to come less often. 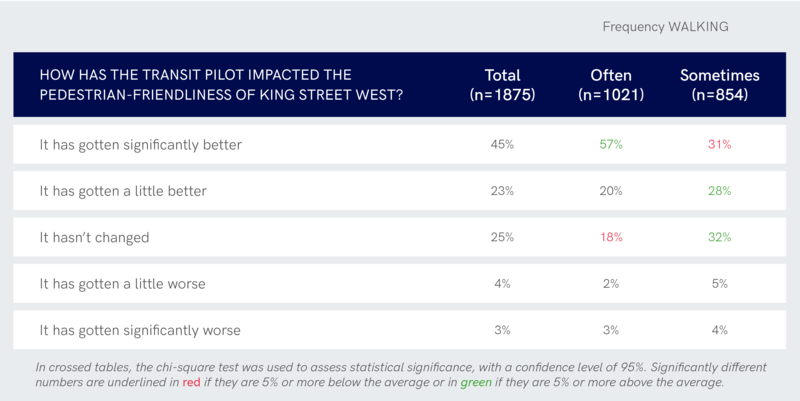 The main thing to notice here is that most of the respondents who declared never visiting King Street West’s shops used to come before the Pilot was put in place (72%). This proves that, while some clients have become more frequent clients, the Transit Pilot has also made King Street West’s shops and services loose some clients, mostly car users and older people. Could you tell us the main reason(s) why you have been visiting the shops and services on King Street West MORE OFTEN since the Transit Pilot was put in place? 751 respondents left a comment. They are mainly public transport users, which is why most comments mention the fact that the Transit Pilot has made street cars move faster and be more reliable on King Street. The comments also mention the fact that it is now more pleasant to walk on King Street and it encourages people to stay longer and visit the shops more often. Bikers and pedestrians also feel safer on the street and crossing the street which contributes to them coming more often. Here are a few examples of comments which sum up the main topics of the rest of the comments. It’s much faster to get around by TTC without all the automobiles blocking the streetcar tracks. I enjoy the art and public seating that lines the street. It makes you slow down and enjoy the space. As a resident of a building on King West, I feel safer as a pedestrian. I don’t have a car, and it is more convenient and faster for me to access businesses on King West via streetcar now that there are fewer cars on the road. I walk by things more often. It’s easier to shop / dine / enjoy the sights with ease of TTC & walking. Before I avoided the area due to TTC congestion. Fewer cars means less exhaust. One can grab their lunch, and sit on one of the Muskoka chairs provided. It’s been a lovely summer. The ease of travel is why I visit the shops there more often now. Plus, I feel safer crossing the streets there. King St streetcar makes it easy to go cross the city in a short period off time. It allows me do my errands and meet up with friends more frequently now. Could you tell us the main reason(s) why you have been visiting the shops and services on King Street West LESS OFTEN since the Transit Pilot was put in place? 555 respondents left a comment. Most of them being mainly car users, the main reasons evoked is the difficulty to drive and find parking there, the fact that the parallel street like Queen Street are now jammed and that the new rules are confusing, which make them feel less safe when driving through King Street. A few comments were also left by people who mainly walk on King Street West. They say that they don’t come there anymore because they feel like the neighborhood has lost its vibe and spirit because there is no one on the street anymore. Furthermore, it is harder for some of them to get a Uber to come and pick them up on the street since cars have difficulties to circulate on the street. The vibe is gone, harder to access parts of it, but mainly the vibe and atmosphere isn’t what it was. I am disabled and need a car to get around. There used to be lots of spots I could access around king street. Now all the nearby streets are too full and king is tumbleweeds. I cannot park anywhere that is close enough for me to go to anything on king now. Difficulty to find parking close to stores and restaurants. If you do it’s blocks away. Hard to get to and from the area by uber or Lyft. Drop you off too far away and too hard to get a Lyft or uber home. It’s very annoying I can’t drive down King St or park on King St. I can’t find parking anywhere nearby. Traffic on the other streets in the area is now brutal. I once frequented that area daily. I now avoid it all together. I’m a real estate agent and no longer encourage my clients to buy condos on King St anymore. The area now looks like a ghost town. The streets are empty. Restaurants have lost business. My son is a server at a restaurant on King St and his hours were cut due to lack od people coming in. This pilot is a disaster and needs to be reversed ASAP. It’s become an inaccessible spot for drivers. It’s actually scary to drive and wonder if I’m in the section closed off to cars and if I’ll get a ticket. I drive downtown all the time and the signage to drivers are unclear and unfair. It’s not clear exactly where the close to vehicles begins and ends. This question was asked to the 1 368 respondents who mentioned visiting the shops and services on King Street West at least a few times a month. Respondents could select multiple choices. Two of the main reasons why people come to King Street West to shop mention the mean of transport they use to get there, whether it is the easiness to get there by public transport (43% of respondents) or on foot (33% of respondents). The second reason why people shop on King Street West is that they work nearby (34%). Finally, despite or thanks to the Transit Pilot, the street is a place people like to go because of its good vibe (33%) and for the variety of restaurants, bars and cafes in the area (33%). It is interesting to note that for the people whose frequency of visit increased, the main reason why they now visit King Street West is because they can get there easily by public transports (58%). This means the improvement of the service of public transport on King Street West (which will be proven later in the report) had a real impact on the willingness of people to come and shop there. The second reason people whose frequency of visit increased selected the most (39%) is that they like the vibe of the neighborhood. This is a first clue that can allow us to say that the Transit Pilot has improved the attractiveness and the atmosphere of the street. Other items of response were also included but collected each less than 30% of the votes. This question was asked to the 465 respondents who mentioned visiting the shops and services on King Street West once a month at most. Respondents could select multiple choices. The reason respondents mentioned the most for not coming more often is that it is difficult to drive there (30%). This reason is mentioned by people whose frequency of visits decreased (74%) as well as the fact that it is hard to find parking (53%). These results underline once again the fact that King Street West’s shops lost some clients because of the negative impact of the Transit Pilot on car traffic in the area of King Street. Items of response were also included but collected each less than 10% of the votes. This question was asked to the 229 respondents who mentioned never visiting the shops and services on King Street West since the Transit Pilot was put in place. Respondents could select multiple choices. Again, the reasons that come first for not shopping at all on King Street West concern the difficulty to drive there (55%) and the fact that it is hard to find parking (38%), which makes for a total of 93% of people who don’t come to King Street West for car related reasons. What is/are the main reason(s) you haven't visited the shops and services on this portion of King Street West? These questions were asked to every respondent. If they declared using a specific mean of transport ‘sometimes’ or ‘often’ on King Street West, they were redirected to sub-questions about their commuting experience with the said mean of transport. Most people walk at least sometimes (91%) on King Street West, making it the most used mean of transport on King Street West. The rest of the figures are aligned with the results to the question about the primary mean of transport, presented earlier. It is interesting to note that among car users, 10% declared never using their cars on King Street West. This is aligned with the results showing that most people who used to go to King Street West mainly by car have stopped coming since the Transit Pilot was put in place. The following questions were asked to the 928 respondents who declared using their CAR at least sometimes to go to or drive through King Street West. The opinion is split on the impact the Transit Pilot had on the average time spent in traffic on King Street West since 39% of respondents believe it decreased (significantly or a little) while 38% believe it increased (significantly or a little). However, the most regular car users are not as split since almost half of them (47%) believe the average time spent in traffic significantly increased because of the Transit Pilot. A majority of respondents (52%) believe the Transit Pilot increased their average time of travel by car in the area of King Street West, even more so for the most regular car users (they are 73% to believe the Transit Pilot increased their average time of travel by car in the area of King Street West). Finally, half of respondents (50%) have reduced slightly or significantly the frequency with which they’ve been using their car on King Street West. This proves that the Transit Pilot reached its goal to reduce the number of cars on King Street West, but it seems it has made the driver’s journey worse in the area and has driven car drivers away rather have them change their commuting habits. The following questions were asked to the 1 647 respondents who declared using PUBLIC TRANSPORT at least sometimes to go through King Street West. 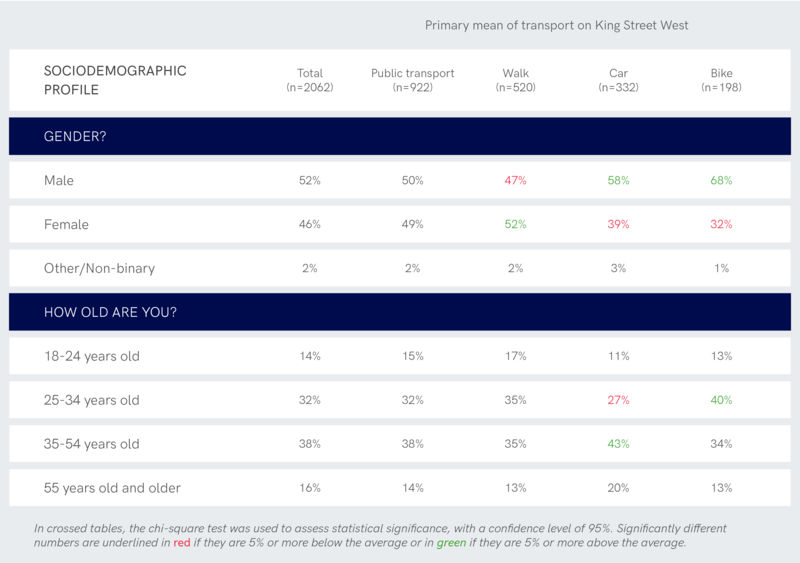 74% of respondents declared the Transit Pilot slightly or significantly decreased their time of travel in public transport through King Street West, even more so for the most regular public transport users who are 85% to mention it. 82% of respondents think the Transit Pilot improved the quality of service for public transport, even more so for the most regular public transport users who are 89% to have mention it. Finally, 58% of respondents have increased slightly or significantly the frequency with which they’ve been using public transport on King Street West. This proves that the Transit Pilot reached its goal to increase the use of street cars on King Street West and improve the quality and reliability of the service. The following questions were asked to the 622 respondents who declared BIKING at least sometimes on King Street West. 84% of respondents declared the Transit Pilot made King Street West slightly or significantly more bicycle-friendly, even more so for the most regular bikers who are 91% to mention it. They are however only 30% to think that the two main bicycle lanes upper north on Richmond St West and Adelaide St West should be relocated on King Street West. Finally, 57% of respondents have increased slightly or significantly the frequency with which they’ve been biking on King Street West. This proves that the Transit Pilot reached its goal to make King Street West more attractive to bikers. The following questions were asked to the 1 875 respondents who declared WALKING at least sometimes on King Street West. 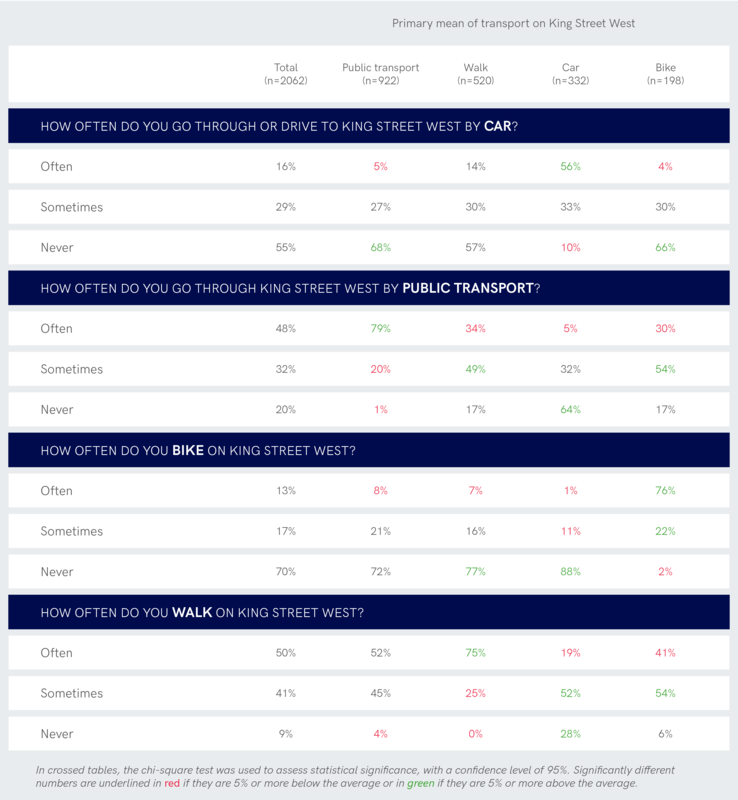 68% of respondents declared the Transit Pilot made King Street West slightly or significantly more pedestrian-friendly, even more so the most regular pedestrians who are 87% to mention it. The effort made by the city to activate the space with public art was noticed and appreciated by 59% of the respondents, and by 70% of the most frequent pedestrians. Finally, 41% of respondents have increased slightly or significantly the frequency with which they’ve been walking on King Street West. With this percentage, it seems like walking has been the mean of transport least impacted by the Transit Pilot. However, readers should bear in mind the results showing that people who mostly walk on King Street West probably already did so very frequently since they are composed of more residents of the area than other groups. This is why, among pedestrians, more people couldn’t increase much the frequency with which they have been walking on King Street West, regardless of the Transit Pilot’s implementation. This proves that the Transit Pilot reached its goal to make King Street West more attractive to pedestrians. The following question was asked to every respondent. What is most striking here is the fact that results are split between very positive opinions on one hand and very negative ones on the other. Hence, the average grade doesn’t give much information. What is more interesting is that 57% of the sample gave a grade of 8 or more to the attractiveness of King Street West compared to 29% who gave a grade of 5 or less. Once again, public transport and bike users have an excellent opinion of the project (average of 8.26/10 and of 8.04/10 respectively), while car users have the exact opposite (average of 2.27/10). Pedestrians are more neutral than others (average of 7.09/10). This is probably linked to the fact shown earlier that some pedestrians feel like the neighborhood has lost its vibe and its liveliness, with less people on the street. On the full table below, we can see that around a third (30%) of people who significantly decreased their use of cars on King Street West gave a grade of 0 to the impact the Transit Pilot had on King Street West’s attractiveness. This probably means that car users didn’t turn to another mean of transport to go through the street, they just stopped coming because the street lost all its attractiveness. It is interesting to note that the worst average grade (2.05/10) was given by people who significantly decreased the frequency with which they’ve been walking on King Street West, while the best average grade (9.24/10) was given by people who significantly increased it. 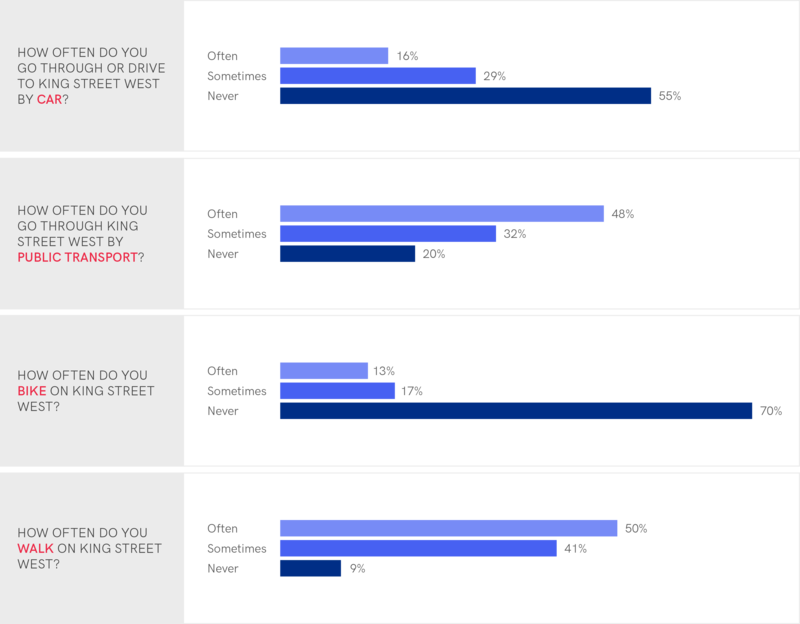 People who walk on King Street West are the most split, but it is not contradictory. Indeed, it is important to remember that the people referred to as pedestrian throughout the report are the people who declared their main mean of transport on King Street West was by foot. Here, the people who answered the question about the impact of the Transit Pilot on their frequency of walking are not necessarily the same. As a matter of fact, we can see in the 4th section that they are composed of an important proportion of car-users. Again, this can be linked to the comments made from people who usually walk on the street, which previoulsy declared that the neighborhood had lost its good vibe. According to you, what should be the future of the Transit Pilot? This question was asked to every respondent. It shows once more that commuters on King Street West are mostly happy with the Pilot since 48% want it to go further, 24% want it to keep going, and only 25% want it cancelled. The people who mainly bike on King Street West are the most in favor of the Pilot going even further (73% compared to 48% in average). Without surprise, people who mainly use cars are almost unanimous to declare the Transit Pilot should be cancelled (83% compared to 25% in average). And again, pedestrians are the most neutral group, for reasons that were already mentioned, even though they remain mainly in favor of the Pilot, with a total of 75% declaring it should keep going or go even further. Should the King Street Pilot project’s design be implemented on Queen Street as well? The Yes wins by a majority (51%) on whether the pilot project should be implemented on Queen Street as well. Again, opinion is split depending on the mean of transport used by respondents. Since the Transit Pilot was put in place, how often have you visited the shops and services (including restaurants, bars and cafes) on King Street West between Bathurst Street and Jarvis Street? When do you usually go to the portion of King Street West identified previously? What is(are) the main reason(s) you visit/haven’t visited more often/haven’t visited the shops and services on this portion of King Street West? How has the Transit Pilot impacted your frequency of visits to the shops and services on King Street West? Why? How often do you drive to or go through King Street West by car? / How often do you go through King Street West by public transport? / How often do you bike on King Street West? / How often do you walk on King Street West? How has the Transit Pilot impacted the frequency with which you have been using your car / using public transport / biking /walking on King Street West? How has the Transit Pilot impacted your average time spent in traffic on King Street West? How has the Transit Pilot impacted your average time of travel by car in the area of King Street West? How has the Transit Pilot impacted your average time of travel in public transport through King Street West? How has the Transit Pilot impacted the bicycle/pedestrian-friendliness of King Street West? According to you, should bike lanes be relocated from Adelaide Street and Richmond Street to King Street West? Have you noticed an effort was made to “activate” the space with public art? On a scale of 0 to 10, what has been the impact of the Transit Pilot on King Street West’s overall attractiveness? 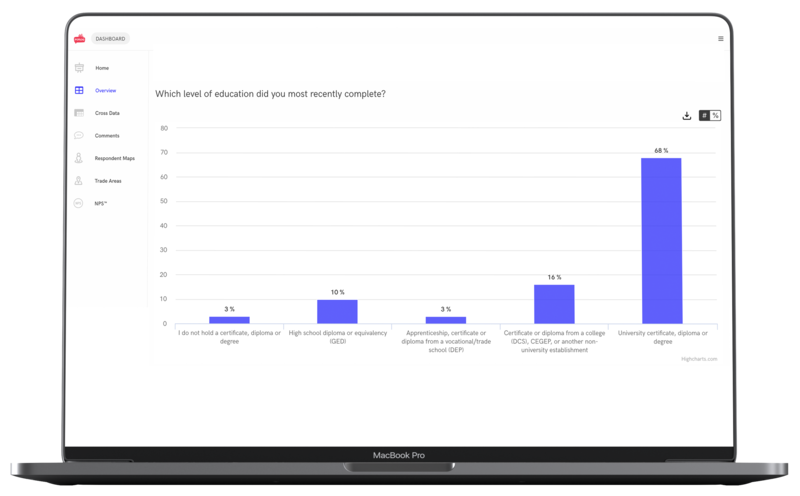 To recruit respondents, a Facebook ad campaign promoting the survey was conducted from August 17th to September 10th, 2018. All residents of the city of Toronto had the chance to see the ads on their Facebook news feed during the data collection period. The page potloc.com/kingstreetwest registered 7 858 unique visitors, which makes up 4.2% of the people who saw the ads on Facebook. Among these 7 858 unique visitors, 2 241 answered the survey entirely. It resulted in a 28.5% completion rate, which is excellent considering that the survey’s average completion time was quite long (12 minutes and 15 seconds) and that participation was voluntary (no rewards were given). Among the 2 241 completed surveys, 179 were discarded for being completed by respondents aged under 18 years old or non-residents of the city of Toronto. Finally, 2 062 completed surveys were considered in the study. Did you enjoy this report? 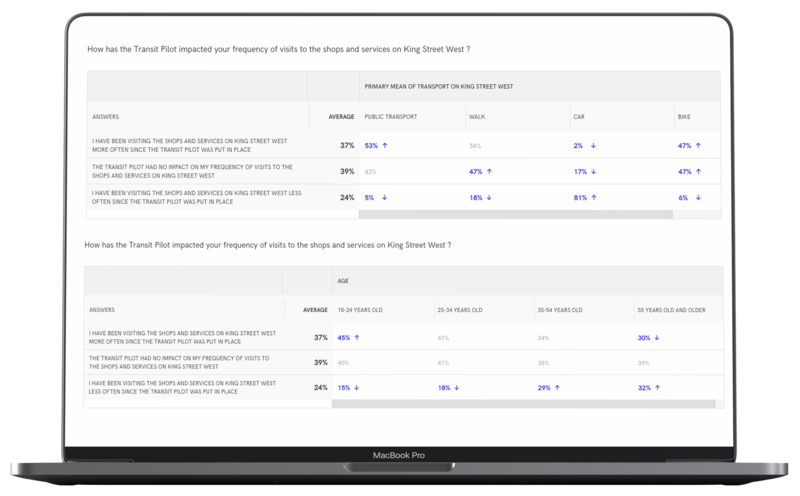 Potloc reinvents retail market research.